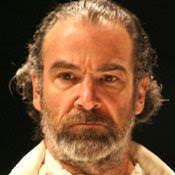 For Back Stage, I have on the stands and on line a long profile of Mandy Patinkin, who is playing Prospero in CSC’s Brian Kulick-directed revival of The Tempest. In The Tempest, one of the last plays William Shakespeare fully authored, the character of Prospero is a conundrum. For 12 years he’s been marooned on an island with his young daughter, Miranda. Struggling to survive, he blackmails the spirit Ariel into being his servant and compels the mortal Caliban to be his slave. For reasons equally simple and complex, Prospero is hero and antihero, protagonist and antagonist. Perhaps it’s those contradictions that make him the perfect role for Mandy Patinkin to play.